I have always been a huge fan of Atari-ya Sushi Bar, especially the one on James Street for their ‘cheap and cheerful’ disposition. As far as hole-in-the-wall places go, this tops my list. Their sushi and sashimi is some of the best in London, and the fact that they supply Nobu and Zuma bears credence to this. Time for a revisit, and I again lapped up the luscious salmon sashimi which is a very reasonable £1.80 for three pieces. (But I still remember back to about four years ago when Atari-ya use to charge ONLY £1 for three pieces!) The salmon nigiri (£1.40) was also fantastically fresh, as was the scallop nigiri (£1.40) which I adore eating with my favourite Japanese herb, shiso (which I always request) for its burst of aromatic flavour. The sea bass nigiri (£1.40) was also particularly satisfying with its lovely sweetness. However, I was less impressed by the soft shell crab roll (£4.50) which was a touch dry and offered little crab meat. 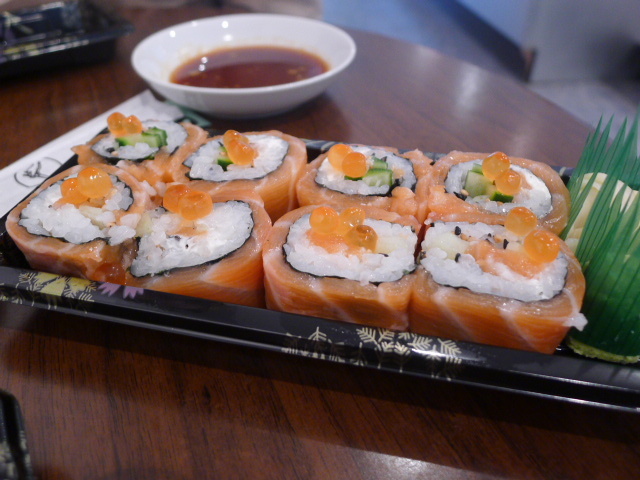 A salmon and cream cheese roll (£4.50) wasn’t particularly to my taste either as the cream cheese was a little overpowering against the delicacy of the salmon. I think cream cheese works better with smoked rather than fresh salmon, although this combination no doubt has its fans. But what did win me over in the ‘rolls’ department was the rainbow roll (£6.50). 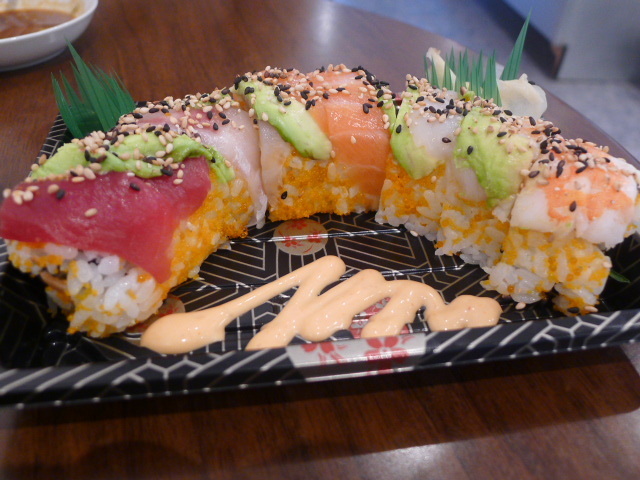 Overlapping pieces of salmon, prawn, scallop, tuna and white fish (either sea bass or sea bream) and avocado are rolled together to provide a melting pot of heady seafood flavours. With another piece of salmon running through the centre of the roll, it proved to be a generous amount of fish for something priced at only £6.50. Tables remain hard to come by, and since my last blog post, Atari-ya James St has moved from dishing up on plates to serving the food in plastic containers. But as it really is a take away place, this doesn’t seem like any great hardship, especially sinceyou can eat for such reasonable prices. Atari-ya James St still remains top on my list for the best value sushi in London. I have also wrote about Atari-ya Swiss Cottage, so check that post too. Price range: About £10 – £20 depending on what you order. Really glad you reviewed Atari Ya St. James. 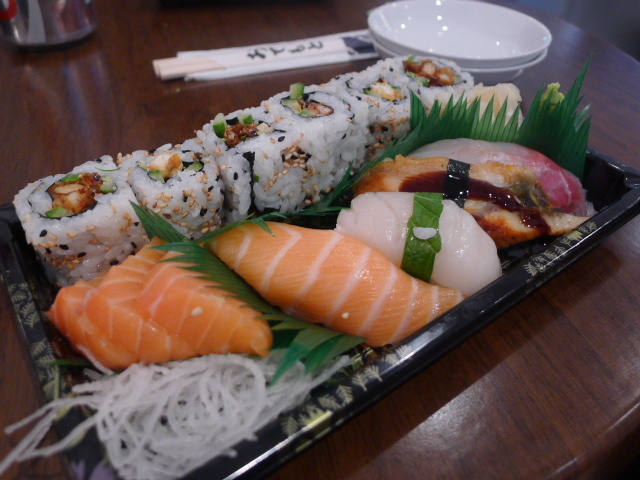 This is our favourite sushi place in London! Everyone should know about this place. Yeah I love it too so I’m glad to spread the word. Hope you are well!